The Pullman Company, from its humble beginnings in the late 1860s by George Pullman, became the face of the passenger train industry during the Golden Age of rail travel through the first half of the 20th century. 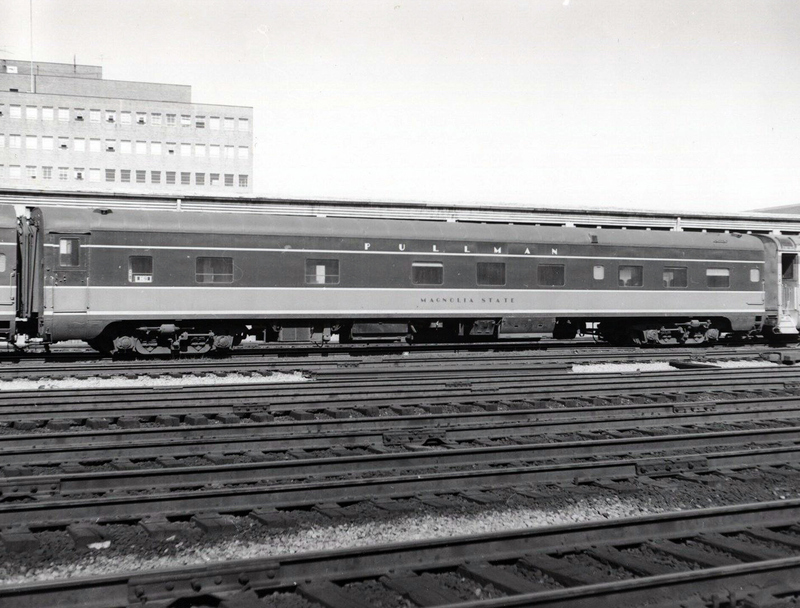 The company became famous for its passenger train cars, especially its sleeping cars, although during the peak of rail travel during the streamliner era of the 1930s several railroads chose Pullman to equip their entire trains (and many railroads were proud of this fact by stating that their trains were "All Pullman" equipped). 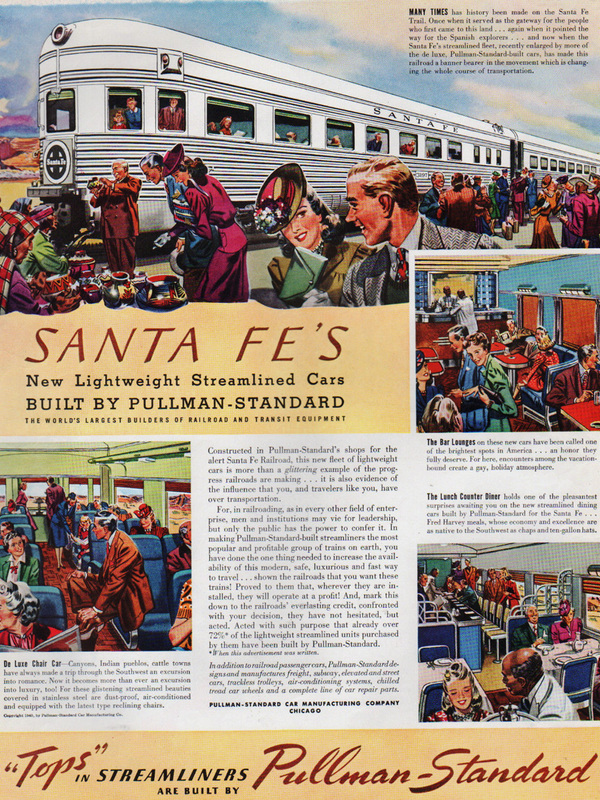 Pullman began facing stiff competition in the market when the Budd Company and their famed stainless-steel streamlined equipment hit the rails, most notably on the Santa Fe's Super Chief and El Capitan trains. As is perhaps to be expected, the Pullman Company died with the privately operated passenger trains and mostly ceased to exist by the late 1960s (although the company attempted to entire the freight car market it was only marginally successful). As far fetched as it seems you can again experience classic Pullman services thanks to Pullman Rail Journeys. The Pullman Company has its beginnings in February of 1867 (originally known as the Pullman Palace Car Company) by George Pullman who was tired of riding on long train journeys with nothing but an uncomfortable bench seat to ride on the entire way and no type of sleeping arrangements. Pullman essentially created the market of sleeping arrangements aboard passenger trains when set up his company a few miles outside of Chicago, Illinois in a newly incorporated town (created in 1880) known as Pullman (everything in the town, including the homes, were all company owned). Pullman's original sleeping cars were not the well remembered full/half bedroom arrangements that would come later in the 1930s and onwards, they were simple multipurpose "berths" whereby the seats could be laid out into a bed during the night. These types of early sleeping car arrangements were quite common for years although Pullman's early cars became just as famous for their luxurious interior decor as for the bedding they provided. In 1900 the Pullman Palace Car Company was renamed simply the The Pullman Company to oversee the corporation's numerous acquisitions it had gained over through the latter 1800s. The Pullman Company would eventually become the parent corporation to several subsidiaries (all owned by the parent), such as the Pullman Car & Manufacturing Company which actually built the passenger cars. Throughout the company's existence building wooden cars of the 19th century to the steel heavyweights of the early 20th century Pullmans were always painted a dark, forest green (there is actually a color called Pullman green, and is still used today by model railroaders), unless specified by a railroad. However, that changed in the 1930s when Pullman broke into the lightweight, streamliner era. The company built its last heavyweight in 1931 and following the debuting of several streamliners in 1934 and beyond Pullman built and painted their cars to match the train's colorful livery. The year of the streamliner in 1934 also saw the Pullman Company's manufacturing division change its name to the Pullman-Standard Car Manufacturing Company when it merged the Standard Steel Car Company into its operation that year. Eight years later, in 1944, Pullman saw significant changes to its operations. It was forced to sell off its passenger car operating division as the US Department of Justice claimed anti-trust violations were occurring by the company having both operating and manufacturing operations. 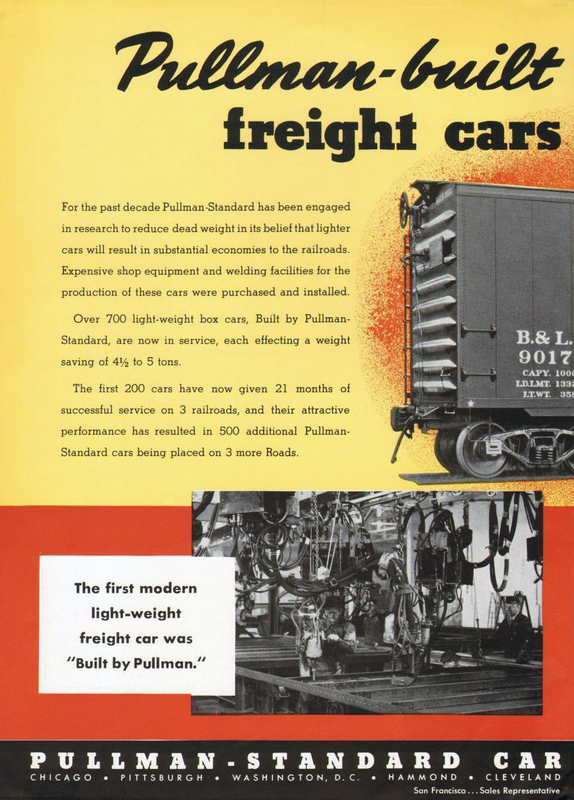 Pullman eventually sold its operating division to 57 Class I railroads but continued to manufacture passenger cars under its Pullman-Standard division (the parent company remained Pullman, Inc.). The Pullman Company operating division had been a trademark aspect of the company. Since Pullman owned its entire fleet of cars, and thus leased them to the railroads to operate within their trains, it also provided full staff and porter services. After selling its fleet to the railroads they had no use for Pullman's personnel and subsequently dropped them from the payroll providing their own on board staffs. And thus, after the breakup of Pullman the company solely built cars no longer providing services aboard them. 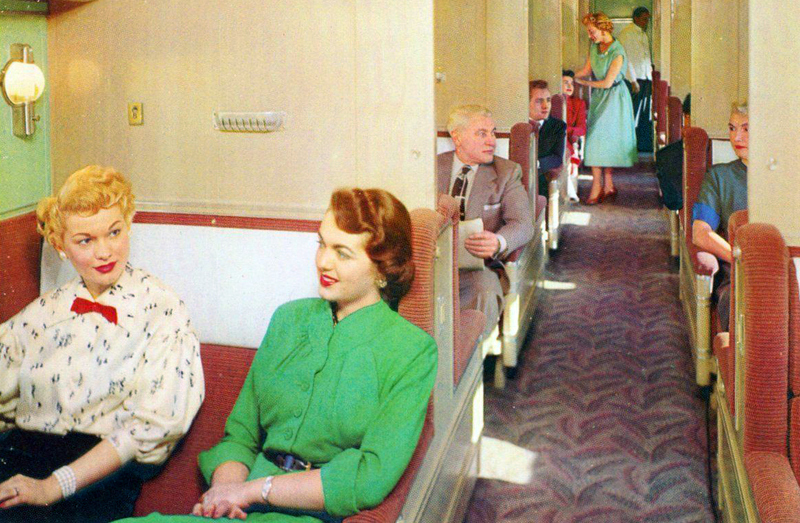 While increased sleeping services began to take hold in the first part of the 20th century, new innovative designs and layouts during the streamliner era meant passengers had a wide range of options to choose from regarding their sleeping arrangements. Instead of simply the option of a berth most Pullman-built sleeping cars on board famous trains like the 20th Century Limited, Super Chief, and Empire Builder carried the choice of a berth, roomette (somewhat like a berth but it also was a small enclosed room with more privacy), or a full bedroom (which featured, among other things, a full private bath). The 1950s were truly the last profitable times for the Pullman Company. 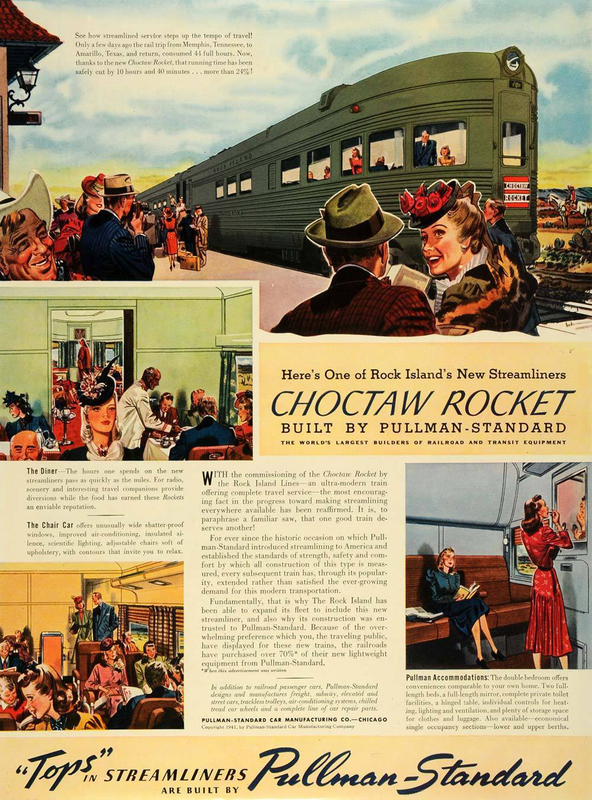 Already receiving stiff competition from Budd since the mid-1930s, during the '50s most railroads ordered their final car fleets as the writing was on the wall that passengers were ditching trains for automobiles. With few orders during the 1960s its not surprising that the railroad aspect of the company ended operations at the end of December, 1968 with all assets dissolved the next day, January 1, 1969. While aspects of Pullman continued on through the 1980s, and some of which remain even today, as a builder of passenger train cars and part of the railroad industry, this all ceased by the beginning of 1969. Following the end of Pullman service it was presumed we would never get to experience the days of friendly porters, elegant full-course dining, full bedrooms, observations, and domes again. Incredibly, however, it was announced in 2012 that a new company known as Pullman Rail Journeys owned by short line conglomerate Iowa Pacific Holdings would be bringing back and has now been established. As of now the company has a select fleet of restored equipment which it plans to run on just a few Amtrak trains. If the traveling public shows growing interest in the return of Pullman services expect the company to grow its fleet and add cars to additional Amtrak trains.